This past week I had the pleasure of keynoting an organization and conducting an in-depth breakout session on the subject of communication. One attendee specifically chose to attend my breakout because she had a problem and was hoping I had the answer. She’s a member of a very experienced department (average age about 50 with an average tenure of 20 years) that had just been graced with a new manager—and things were not working out. The new manager had all the credentials: bachelor’s degree, master’s degree in the subject matter, and five years of previous experience. So what’s the problem? Well, she was from the Millennium generation—the 30-year-olds set to take over our world. To state the obvious, a 30-year-old brought in from outside to manage an established department of 50-year-olds who know their jobs inside and out will most likely create some communication problems. But that’s not the issue my attendee brought to me. The problem is that this leader manages by sequestering herself in her office and communicating by intra-office email even though she’s on the same floor. In her first year, she has not taken a single direct report to lunch. What’s the big deal? Why was my attendee and the rest of her department so upset? To answer the question, we need to go back to the work of Albert Mehrabian. Some of you have been around this e-zine long enough to remember my article about Mehrabian’s work in the early 1970s. He concluded that words alone, while important, are usually not enough to get our whole message across. 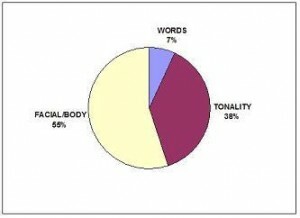 Mehrabian found that when we are communicating, we use three channels: words, the verbal tonality with which the words are delivered, and body language or facial expressions. Mehrabian discovered that if we are communicating more than simple data (Where’s the meeting? Room 103. What time does it start? 3:15), the communication value of the words tends to drop. For example, when the receiver detected a disconnect between the words and the tonality or body language with which they were delivered, the receiver tended to trust the physicality (body language and facial expression) 55% of the time and the tonality 38% of the time. Simple deduction concludes that in these very important conversations, the words were only received and trusted 7% of the time. Taking Mehrabian’s research into account, can you see why the employees are troubled? The new manager has a style of communication that doesn’t allow her reports to evaluate her tone or body language. They can’t “read” her and therefore have difficulty understanding what she is saying. This is not the first time I’ve been apprised of the text-based preferences of many Millenniums. Several clients report similar communication issues. I know some Boomers who’ve decided closing their doors and emailing the world is OK, too. In fact, I know some major organizations that frown on phone usage and personal meetings, demanding text-based communications whenever possible. Still, Millenniums and everybody else need to consider how they are communicating in a physical sense if they really want to be heard and understood. Feedback? Leave a comment for us. How does it work in your office? « Moment of Clarity, March 2011: How do you feel about that?